The impulse interface converts spike and square impulse into square impulse with an accurately defined low resting potential. 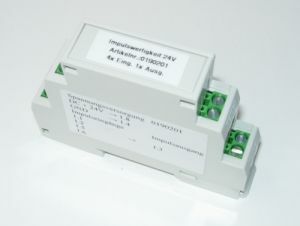 This impulse interface interconnects 2 separate inputs, each with 2 different inputs, into 2 separate outputs. Remarkable is the fact that inputs from an impulse encoder with a spike signals are converted into easy to read square impulse.